It’s been a busy week for me as I spent most of week traveling for work. Please excuse me while I play catch up. 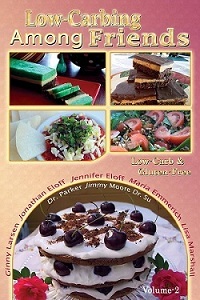 The recipe today is featured in the “Low-Carb Friends” section of Low-Carbing Among Friends Volume-2, Page 303. I was so glad to have been asked to contribute a recipe to this amazing low carb resource. 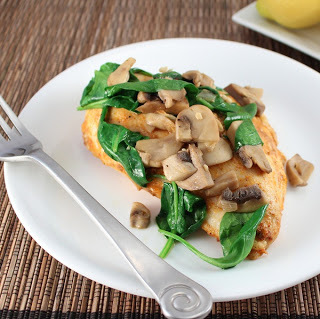 You will have to check out the book for the complete recipe, but the chicken is coated in a savory spice mixture and topped with sautéed spinach and mushrooms. It’s so easy to throw together for a weeknight dinner and the coating keeps the chicken moist and juicy. Information from Steve Parker, M.D. and Robert Su, Pharm B., M.D. I highly suggest picking up this cookbook for lots of great low carb and gluten free recipes to keep you on track. Visit the LCAF Facebook page to see more pictures from LCAF Vol-2. Click the cover icon below to purchase through amazon or visit the Low-Carbing Among Friends website (coil bound books sold on LCAF site).